Pityriasis versicolor (PV), also known as tinea versicolor, is a common, benign, superficial cutaneous fungal infection usually characterized by hypopigmented or hyperpigmented macules and patches on the chest and the back. In patients with a predisposition, tinea versicolor may chronically recur. The fungal infection is localized to the stratum corneum(outer layer of the epidermis) resulting from a change to the mycelial (filamentous fungus or mould) state of dimorphic yeasts of the genus Malassezia. The lesions are: (a) flat; (b) only partially depigmented—areas of vitiligo are totally white; and (c) do not show inflammation or vesicles. Tinea versicolor is common in persons aged 15-24 years, when the sebaceous glands are more active. The occurrence of tinea versicolor before puberty or after age 65 years is uncommon. In more tropical countries, age frequency varies, most cases involve people aged 10-19 years who live in warmer, humid countries, Like: Liberia and India. Spots that may occur anywhere on body but are most commonly seen on the neck, chest, back, and arms. Because the yeast grows naturally on skin, tinea versicolor is not contagious. 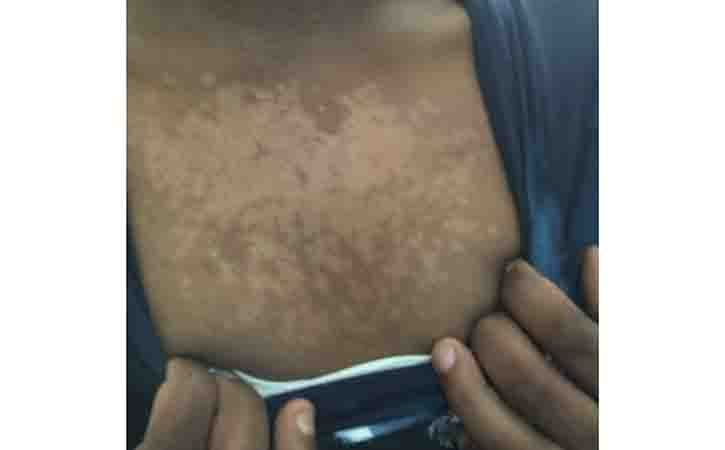 The condition can affect people of any skin color. It’s more likely to affect teens and young adults. Clotrimazole: Clotrimazole topical is a broad-spectrum antifungal agent that inhibits yeast growth by altering cell membrane permeability, causing fungal cell death. Reevaluate the analyze if no clinical improvement is seen after 4 weeks. terbinafine: Terbinafine topical inhibits squalene epoxidase, which decreases ergosterol synthesis, causing fungal cell death. Use this medication until symptoms significantly improve. The duration of treatment should be greater than 1 week but not greater than 4 weeks. ciclopirox: Ciclopirox interferes with the synthesis of DNA, RNA, and protein by inhibiting the transport of essential elements in fungal cells. ketoconazole: Ketoconazole is an imidazole broad-spectrum antifungal agent. It inhibits the synthesis of ergosterol, causing cellular components to leak, resulting in fungal cell death. Ketoconazole achieves excellent skin levels with minimal oral dosing, but oral treatment with this agent for skin infections is contraindicated because of safety concerns. Long-Term Monitoring: Tinea versicolor has a high rate of recurrence, and prophylactic treatment with topical or oral therapy on an intermittent basis is necessary to prevent recurrences in most cases. To confirm analyze, need to visit a doctor. In long term treatment, must consult with a doctor. Also if concern about skin, visit a doctor before using medication, not only oral medication but also tropical.